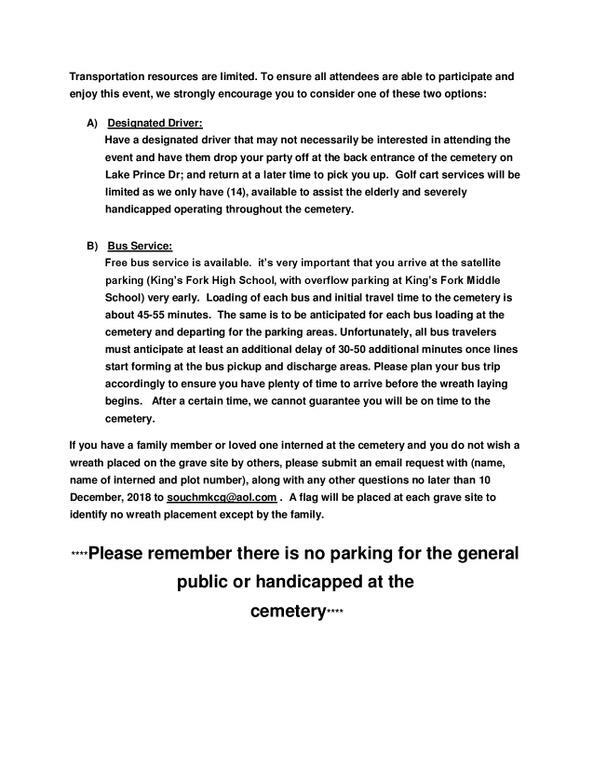 If you have a family member or loved one interned at the cemetery and you do not wish a wreath placed on the grave site by others, please submit an email request with (name, name of interned and plot number), along with any other questions no later than 10 December, 2018 to [email protected]. A flag will be placed at each grave site to identify no wreath placement except by the family. The Horton Wreath Society welcomes Donations all year long. Since 2008, The Horton Wreath Society has provided live wreaths for every grave site at the Albert G. Horton, Jr., Memorial Veterans Cemetery in Suffolk Virginia. These Wreaths are made possible by generous donations from individuals and organizations. We receive donations from all over the United States. 99 Percent of our donations go to the purchase of the Live Evergreen Wreaths. Last year, December 2015 over 7,000 Live Wreaths were placed at the cemetery by over 5,000 volunteers, with more being added every year. Wreaths are needed for all sites, and we accept donations all year long in preparation for Our Annual Wreath Laying Ceremony. 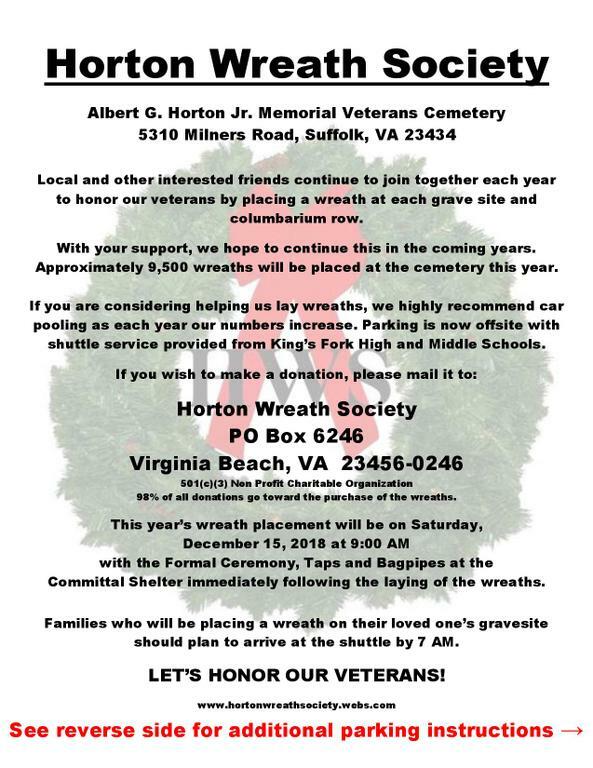 The Horton Wreath Society meets the 4th Saturday of the month, at 9:00 am at the Main Admin Building at the Albert G. Horton Jr. Veterans Cemetery in Suffolk Virginia. We welcome all volunteers, visitors, and guests to our meetings. Our goal each year is to provide a Live Wreath for each Gravesite/Columbarium row at our Annual Wreath Laying Event in December. are registered service marks of the Horton Wreath Society, Inc.